Buoyed by polls showing a slight uptick, as well as fundraising he says is improving, Sen. John McCain set out Sunday to win New Hampshire votes with his trademark blunt talk. The 71-year-old Arizona Republican, who would be the oldest president ever to start in the White House if elected next year, quipped that he should bring his 95-year-old mother on the campaign trail "to display my genes." He blasted the "military thugs" in Myanmar who are attempting to maintain their junta despite protests of Buddhist monks, and said "we should make the Chinese pay a price" for supporting the regime in the nation formerly known as Burma. And McCain labeled President Vladimir Putin as "the dictator from Russia" as he called for U.S. energy independence to curb oil imports from the former Soviet Union, Venezuela and Iran. In a 90-minute town hall meeting that resembled a policy tour de force, McCain also challenged a woman in a wheelchair who declared she needed medical marijuana to withstand the pain of a litany of ailments. "Every town hall meeting I have, someone shows up and advocates for medical marijuana, and, by the way, in all due respect, alleges that we are arresting the dead and the dying, and I still have not seen any evidence of that," McCain told his questioner. "I still would not support medical marijuana because I don't think that the preponderance of medical opinion in America agrees with your assertion that it's the most effective way of treating pain." McCain's approach attracted admirers within the crowd, similar to the support he garnered in 2000 that allowed him to win the New Hampshire primary before ceding the nomination to George W. Bush. "You get more of a straight answer from him that you get from other politicians. That's why this format is good," said Patrick Bracken, 58, of Hampstead. He voted for McCain seven years ago and plans to again next year in the state's first-in-the-nation primary. Melissa Skinner, 27, of Manchester, said she remained undecided about the candidate she will support, but, "I found him very personable. He can be lighthearted about serious issues." 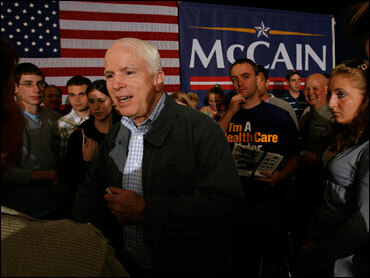 McCain spoke the same day that all the presidential contenders wrapped up their third-quarter fundraising. Their totals, which will be reported by the middle of October, provide an unofficial barometer of their political health. After a midsummer staff shake up and generally positive reviews in recent weeks, McCain said he anticipated an effect on his fundraising, though he declared he had no sense of his fundraising total. He also held out two caveats: that Senate business and his two-week "No Surrender" tour across early voting states have infringed on his fundraising time. "That restrained us a bit, but we're satisfied where we are and I think we've got the impetus to move forward," the senator said. As for the recent polls, he told reporters: "I pay attention to the polls, but I realize they are snapshots, and I see that we are improving in the polls, but we have a long way to go." McCain also expressed displeasure both in Derry and later at a house party in Hollis after the weekend publication of an interview in which he said he would prefer a Christian president for the United States. The senator made the remark after Beliefnet, a multi-denominational Web site, asked whether a Muslim candidate would be a good president. Recently, McCain also grew exasperated after facing questions for labeling himself as a practicing Baptist despite being raised an Episcopalian and describing himself that way in campaign literature. "All I can say is that maybe I should have kept my comments to the fact that I'm a practicing Christian, I respect all religions and beliefs, and that I support the principles, the values of the Founding Fathers. Perhaps I should have couched my remarks to that rather than getting into, as I say, a Talmudic discussion," McCain said.